Save $1,000 to $1,500 per couple off this river cruise. Expires April 30. Click here for eligible departures. Castles from ancient empires and steep vineyards sprout up from every angle, which makes cruising on the Rhine River feel like entering a scene out of a storybook. Wind through Switzerland, France, Germany and the Netherlands, diving deep into the history and wine regions of this vital waterway. Inspirational towns have given way to great stories, such as Heidelberg, where Mark Twain wrote “A Tramp Abroad.” Timeless traditions still remain intact—from the making of Cologne’s Kölsch beer to the making of Rüdesheimer coffee. Sample wines from France’s Alsace region while in Riquewihr, Freiburg and Strasbourg; and walk through the vineyards of Rüdesheim tasting the Rheingau’s Rieslings. 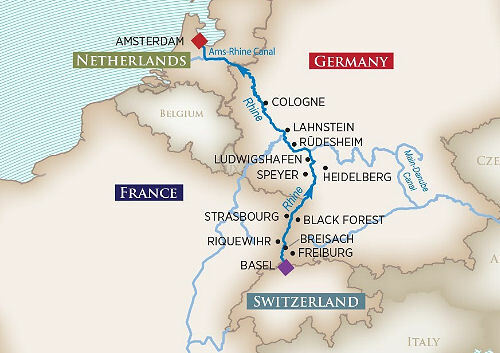 Take a front-row seat on this enchanting journey along the Rhine.